Who wants to cook in this weekend's heat and humidity??? We certainly did not. 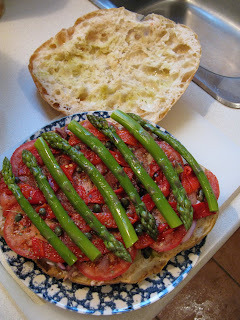 So we had our favourite sandwiches for Sunday dinner -- Pan Bagnat. It's like a salade nicoise sandwich. The first time we made it, we made it from a recipe we found on Epicurious. We have since adapted it to our taste and the ingredients we have on hand. Artichoke hearts is one of our favourite additions. This time, we have no artichoke hearts nor anchovies, but added the leftover asparagus.